The Defining Part of the Season? Time for another periodic overview of the season so far. Towards the end of October, I wrote an article about how Blackpool’s season was panning out after the first eight league games. The mood at that time was not quite as buoyant as it had after the first four games, but the consensus was that ‘Pool were performing above expectations (admittedly not too hard). Examining the next seven matches (Birmingham until Bolton) I had identified this as a crucial period in the season. Compared with the opening fixtures, many of these should have been seen winnable, and so it was vital that points were picked up in this period. I surmised that reaching 20 points or more would be a great return, and survival would look more than achievable. While not quite reaching that target, ‘Pool fell only one point short and if they can replicate this points tally over the 38 games, a mid-table finish is on the cards. In truth though, each batch of fixtures is crucial, and no side can afford to hit a prolonged bad run of form, which in some ways makes the upcoming games even more significant. All of the next six matches see Blackpool take on top half sides – a daunting proposition. As Tangerine Dreaming rightly point out, it is vital that ‘Pool continue to “rack up the points” on a regular basis – a rocky spell will dent confidence and have the media turning up the pressure on Ian Holloway and his squad. Despite the tough opposition coming up in the next few weeks, it will be important for the Seasiders to pick up unexpected results. The three home games are about as difficult as they come and even a much-weakened Liverpool team should be respected, albeit not feared. Burnley showed last season that it is possible to take points off the top sides at home, but just one victory from these three would have to be considered a decent tally – any more than that would be a welcome surprise. On the road the fixtures are just as tricky starting with a challenging trip to the Britannia against Stoke. Like the Potters, Sunderland are a good home side and despite some fairly uninspiring displays, the sheer amount of talent at Mancini’s disposal makes the journey to Eastlands one of the hardest away days of the campaign. 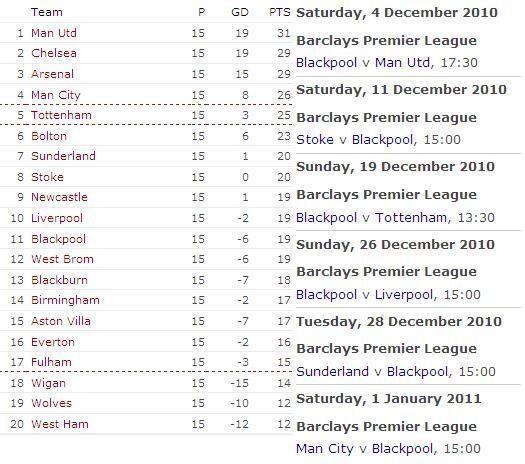 What would be a decent points return from these games then? So far Holloway’s side have kept ahead of the rough point-a-game safety target of 38 points (although it may require as many as 40 this season), but even six points from the upcoming six fixtures looks a big ask. Even as few as four points wouldn’t be disastrous, but what is probably more important from a morale standpoint is avoiding losing more than two consecutive games. What Blackpool have done particularly well thus far is earning points on a regular basis. While back-to-back victories have until now eluded the Seasiders, Blackpool have only lost two consecutive games on one occasion back in September with defeats to Chelsea and Blackburn. I think it’s inevitable that a slide from the current 11th position will take place over the course of the next six games, but if Blackpool can stay out of the bottom three following these matches, then confidence in the camp should remain high. Then again, the January transfer window could impact things yet further. Insert your favourite rollercoaster cliché here.